Get Started Today and Save 60%! We love Joomla! And when it comes to making sure things run smoothly, we look to SiteGround. The SiteGround team has created unique in-house server infrastructure optimized for outstanding Joomla performance. Through innovative technologies, up-to-date server software and constant optimizations, SiteGround provides the very best performance for your Joomla website. 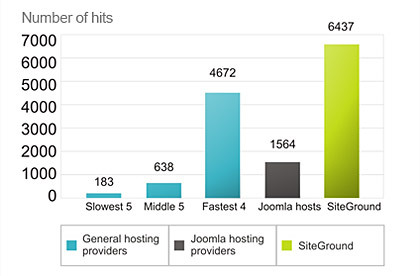 The speed performance tests prove that SiteGround is not only faster than the standard hosting providers, but also than the Joomla niche hosts! Through special in-house developed technology all accounts on SiteGround servers are isolated from each other, so even if there is one vulnerable installation, the other Joomla websites will be safe! SiteGround performs ongoing security status monitoring across all their servers thus ensuring the most enhanced Joomla security! The SiteGround support team provides free assistance with more Joomla related issues than any other host and do it 24/7 via phone, chat and ticketing. With an average response time of less than 15 minutes on tickets and practically no wait times on chat and phone, you get the best Joomla support you can find!